Elegant straw hat made of tule from Michoacan with brown border. Unisex. One-size-fits-all. 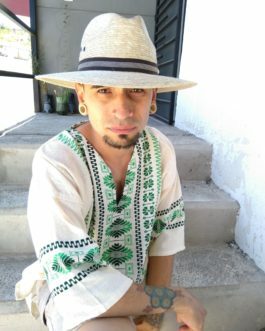 Featured model: Ce Acatl Borsegui of Yacatsol / Xica Media wearing a Chiapaneca shirt in green, available here. Elegant straw hat made of tule from Michoacan with brown border. Unisex. One-size-fits-all. 14.5" long, 13.5" wide (outside) and 7" x 8.5" (head space.) Featured model: Ce Acatl Borsegui of Yacatsol / Xica Media wearing a Chiapaneca shirt in green, available here. Available in assorted colors (blue, black, brown, white/beige, red/maroon) with multicolored patterns. Colors subject to availability. 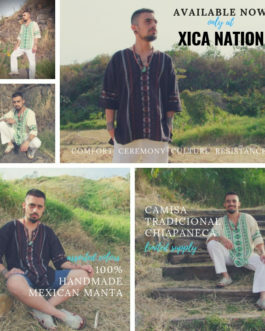 The CAMISA TRADICIONAL CHIAPANECA de MANTA is a great choice whether you want to be comfortable, attend ceremony, dress for work, or decolonize your style. Made with pure cotton, the fabric is breathable and perfectly suited to keep you comfortable despite the weather. Traditional Mexican stitch patterns from Chiapas bring eloquent style and culture into any environment, including the outdoors, home, or the work space. Direct from the maker. 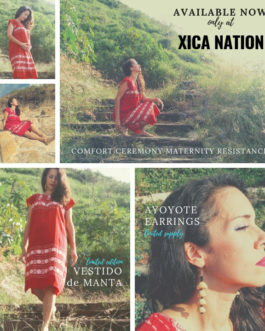 Whether you want to be comfortable, attend ceremony, enjoy maternity wear, or decolonize your style/lifestyle, the VESTIDO DE MANTA is for you. As a living part of a millenary tradition, the vestido de manta has been a staple in indigenous Mexican attire. Made with pure cotton, the fabric is breathable and perfectly suited to keep you comfortable despite the weather. Traditional Mexican stitch patterns bring beauty into any environment, including the outdoors, home, or the work space.